Making the best Steak Tips in NH, New England, and quite possibly the country isn’t easy. Over the years we’ve had so many requests on how to make the marinade, how long to marinade, and the best way to cook them. If you follow the recipe below step by step I can guarantee your friends and family will be blown away. 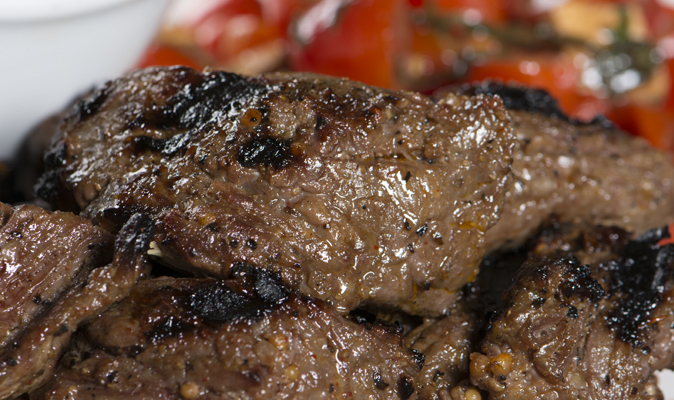 And you will be crowned the Steak Tip Hero of every cookout you go to. Now some of the ingredients are hard to find. If you are unable to source all the items, and can’t make it to Tuckaway Tavern in Raymond NH, don’t freak out. We have a solution! Check out TuckingGood.com where you can have it shipped directly to your house ANYWHERE in the US. You can order our award winning tips, homemade sausages, custom burgers, hand cut steaks from our butchers, and all the great food from our deli that you can’t find anywhere else. When making the marinade it’s important to mix thoroughly with a food processor or blender. We recommend massaging the tips first and loosening up with a bottle of Chianti. Let the steak tips sit for at least 12 hours so the marinade has time to work it’s magic. Good luck, and enjoy! Awesome! Thank you….one question…where does one find a unicorn? From everything I have read, Noah didn’t bring them on the boat. Oh well, just have to make the trip to you guys for my tips! We get random deliveries of unicorns throughout the year. One must be waiting at the end of the rainbow is what we hear but we are yet to catch one to verify. Is the Chianti for rubbing the tips or for drinking while you prepare them or both? That is up to the chef! Is this for real? In other words, taking out the jokes in between….this will work? ❤️❤️❤️ Your Tuckin Tips!! The answer is no Marsha. EVERY bit of that recipe is necessary to perform our meat magic..
Now if you could make it easier to buy a gift card on your website, we’d be all set! It’s always multiple phone calls, and then waiting for a call back. thanks! I prefer to use Superman, where can I find the best unicorns around? Never ever give away a great recipe. The secret is yours to keep. I live far enough away that I can’t make the trip too often but my daughter has asked me to return several times. She loves your steak tips and your chicken, best ever. Please open up down south real soon, can’t wait. Hope you found a spot, there are plenty on rt1. You will be a success in this area. Why don’t we just use the rub you provide??? Although I’d like the marinade recipe, I really want the corn recipe I had several times this summer. It was awesome. Don’t throw away the horns from the unicorns. They’ve been used since the Dark Ages to cure the Plague and other afflictions.